In September of 2015 I embarked on a year of service in Israel as a volunteer in the GMW-supported Yahel Social Change Program, in the largely Ethiopian-immigrant neighborhood of Ramat Eliyahu, a GMW Federation partner community in Rishon LeZion, Israel. As a Montclair native and a proud member of the GMW community (a Diller Teen Fellow ’09-’10 cohort alum), I was generally aware of our significant tie to this special place, even before arriving. However, what that partnership means to me now — after ten months of volunteering, living, and breathing Ramat Eliyahu — is more than I could have ever fathomed. Our Federation’s aid to this community has a major hand in the area’s most innovative, successful, and future-oriented institutions and projects. I am now proud to highlight a few flashpoint GMW-funded initiatives, which I was fortunate enough to both observe, and work on long-term, throughout this period. 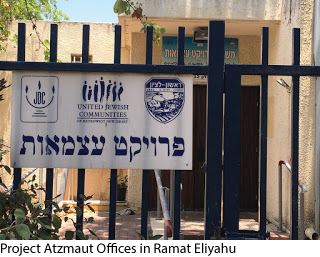 Much of my volunteer work this year was rooted in the “Matnas” (“Community Center”) of Neve Eliyahu—named for the two adjacent communities of Ramat Eliyahu and Neve Yam that it services. The Matnas was established in 1978, in large part by the generosity of past MetroWest Federation president Sam Oolie, along with our Federation’s support as a whole. GMW has supported the Matnas, and many of its major initiatives and activities, ever since. The Matnas Learning Center is a near-daily after-school program held in the community library, during which local kids work with volunteer tutors in all subjects. This incredible effort (that I experienced firsthand as an English tutor) is helping many young people get ahead. 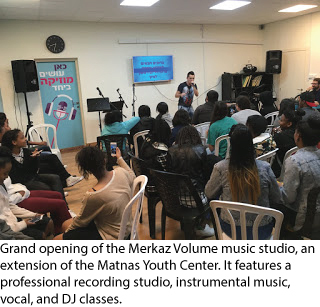 The Matnas Youth Center is another special place that I can definitively say is the foundation and has most wide-reaching positive influence on youth life and culture in Ramat Eliyahu. It runs a variety of leadership-building, creative, and community service programs, as well as many other events such as supervised “hang-out” spots, and much more. The institution services hundreds of at-risk youth in the community and has a unique and effective formula offering and continuously developing programming of all kinds to bring kids inside its doors and away from the more dangerous and negative influences of the streets. As a volunteer here, I helped develop a sports program for community youth focused on building leadership and responsibility. We saw that, through sports, we were able to attract some of the more difficult kids in the neighborhood to the Youth Center. 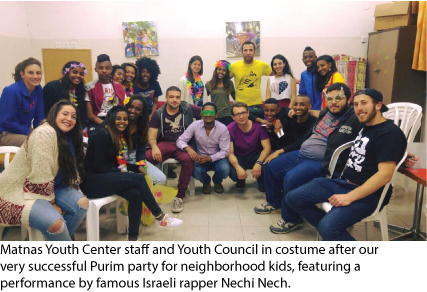 This and programs such as the center’s Madatzim (Young Leaders group), and the community Youth Council, the Zuz Dance troupe, among others, build accountability, leadership, and positive communal relations among this next generation of Ramat Eliyahu. The results are astounding. The teens themselves are now organizing many of the communal events, such as holiday parties and summer festivals. Outside of the Matnas is Project Atzmaut — a revolutionary organization established with the integral financial and strategic support of GMW. It is a completely Ethiopian-led project that has serviced hundreds of local families in providing vocational training, education, and family management aid. As a volunteer in its broad and insightful Homework at Home program, I worked with an Atzmaut family to help them understand the importance of homework and after-school studying, a challenge within a population where many parents did not receive any type of formal education in their rural agricultural villages in Ethiopia. These projects are just a portion of the many ways our community is having a meaningful impact here. However, there is still so much work to do. In discussions with staff around the community, I learned of many pressing needs. For one, as the Youth Center’s programs continue to expand, so does the need for more professional training for the center’s staff. Also, Matnas’s Amitim initiative for local adults with special needs requires more funding for programming focused on integrating its participants into the community. And there are many more. 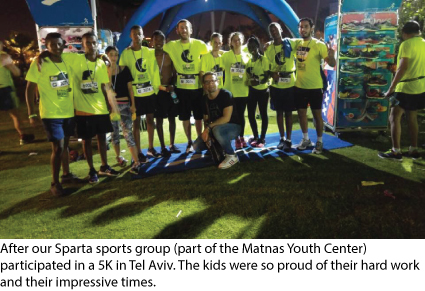 Overall, the vision and unrelenting determination of Ramat Eliyahu’s community organizers have created a wealth of opportunity and empowerment for its people. I’m proud that GMW is an unequivocal part of the engine that drives them, and, through our active, continued support, we can strengthen our sustained role in helping build a better Israel, and providing more equal opportunity to those in need. Our Federation is a crucial foundation for communal hope in Ramat Eliyahu, giving thousands of residents paths to a brighter future. For a more detailed version of this post, check out my personal blog here.